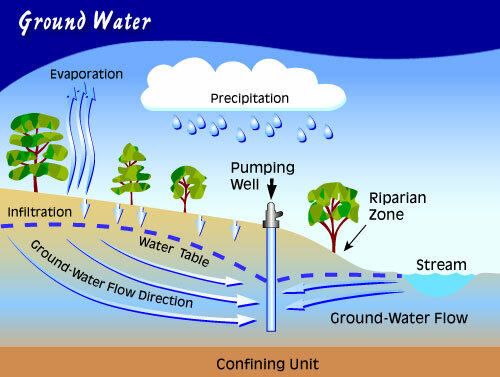 The volume of groundwater is estimated to be more than 30 times the combined volume of all fresh-water lakes in the world and more than 3,000 times the combined volume of all the world’s streams. Some water underlies the Earth’s surface almost everywhere, beneath hills, mountains, plains, and deserts. It is not always accessible, or fresh enough for use without treatment, and it’s sometimes difficult to locate or to measure and describe. This water may occur close to the land surface, as in a marsh, or it may lie many hundreds of feet below the surface, as in some arid areas of the West. Water at very shallow depths might be just a few hours old; at moderate depth, it may be 100 years old; and at great depth or after having flowed long distances from places of entry, water may be several thousands of years old. Ground water has been known to humans for thousands of years. Scripture on the Biblical Flood states that “the fountains of the great deep (were) broken up,” and Exodus, among its many references to water and to wells, to “water under the Earth.” Many other ancient chronicles show that humans have long known that much water is contained underground, but it is only within recent decades that scientists and engineers have learned to estimate how much ground water is stored underground and have begun to document its vast potential for use. An estimated one million cubic miles of the world’s ground water is stored within one-half mile of the land surface.